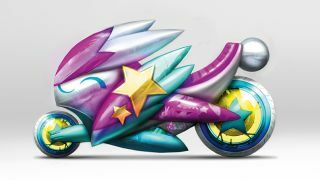 Create an eye-catching anime-style vehicle with these four tips. Applying manga styling to a vehicle such as a car or a motorbike can easily be achieved with good reference and creative problem-solving. I first collect references of the vehicle I want to depict from stock websites like shutterstock.com, and manga versions of that vehicle and any other manga references that will inspire the design. At this stage I also think about what types of themes I want to use when it comes to how to draw manga vehicle designs. Then I start sketching out different black and white ideas for the manga vehicle, thinking about value, silhouette and unique iconic shapes. Once I have the first round of ideas sketched, I pick one and sketch it out more, working in black and white and with silhouette and value. I then do different colour explorations for the chosen design, thinking about the types of colours and colour schemes that would fit for the type of design I’m going for and the type of character that will ride this vehicle. Once I’ve decided on the final design and colours for the vehicle, I refine, render and light the final design, focusing on final polish and materials. I collect references for the vehicle I want to design from stock photo websites such as shutterstock.com. I also collect any other manga references for inspiration. I think about what direction I want to take the design of the manga vehicle in, and consider who the driver or rider will be of this type of shoujo manga vehicle, which should appeal to a teenage girl audience. Next, I sketch out the first set of different ideas for the manga vehicle. I think about many different kinds of ideas during this first phase of iteration. I also work in black and white and only think about value, shape, and iconic silhouette at this stage. Once I have sketched out the different ideas that I want, I choose the final idea that I want to explore further. Next, I do more black and white value concept iterations of the chosen idea. I put together elements that I like from some of the other concept sketches and unify them into new variations for the chosen idea: the manga bunny motorcycle. I select some of the elements to use from the star motorcycle and cat motorcycle to create more versions of the bunny bike. Once I’ve finalised the bunny motorcycle design, I produce different colour schemes for the design using bright shoujo colours. I then settle on a final colour scheme and render, light and refine the final concept. I create a new black layer, set it to Color Dodge mode and start painting on that layer with a light colour to add in quick lighting and metallic highlights.